Åland Frama 1984 (First Design): .10, 1.10, 1.40, 2.00 plus Åland 1.40 1984 Flag stamp and Finland 1982 2.40 Parliament stamp, total franking 8.40, on 11 December 1984 10 gram REGISTERED cover from HAMMARLAND to HELSINKI (with receiver on reverse). The registry label has handwritten "Hammarland" town name. 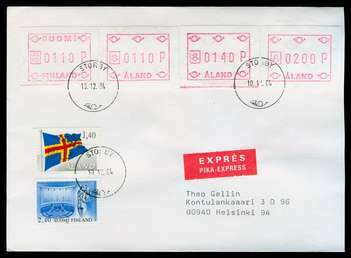 At this time, Åland and Finland stamps were both valid in Åland. The Frama stamps represent the original three pre-set values, plus an ad-hoc .10 value. Quite interesting and unusual in several regards. Åland Frama 1984 (First Design): 1.10, 1.40 x2, 2.00 plus Åland 10.00 1984 St. Olof Seal stamp and Finland .50 M-75 definitive stamp, total franking 16.40, on 10 December 1984 REGISTERED EXPRESS cover from ECKERÖ to ESPOO, Finland, (with receiver on reverse). The registry label has pre-printed "Eckerö" town name. At this time, Åland and Finland stamps were both valid in Åland. The Frama stamps represent the original three pre-set values. 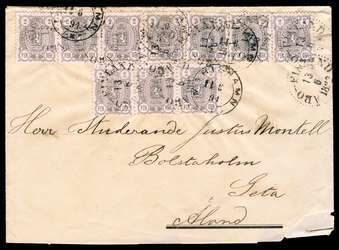 Quite interesting and unusual in several regards; Åland express covers are very scarce. 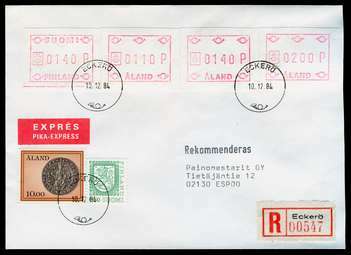 Åland Frama 1984 (First Design): 1.10 x2, 1.40, 2.00 plus Åland 1.40 1984 Flag stamp and Finland 1982 2.40 Parliament stamp, total franking 9.40, on 10 December 1984 EXPRESS cover from STORBY to HELSINKI (with receiver on reverse). At this time, Åland and Finland stamps were both valid in Åland. The Frama stamps represent the original three pre-set values. 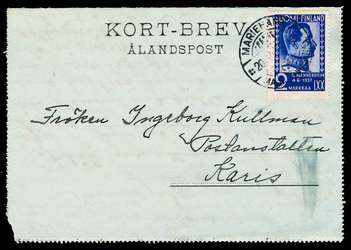 Quite interesting and unusual in several regards; Åland express covers are scarce. 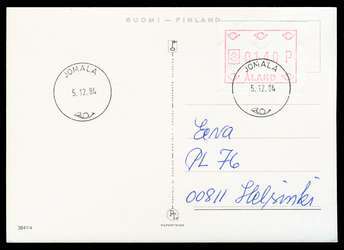 ÅLAND Frama 1984 (First Design): 1.40 on 3 December 1984 cover mailed within Helsinki, Finland, with "HELSINKI 10" cancellation to the side. The Åland stamp was not valid in Finland (but Finnish stamps were valid in Åland at that time) and thus it was faintly "marked off" in pencil with a "0" indicating no value. The cover was marked 2.40 postage due boxed "T" handstamp with amount written in. 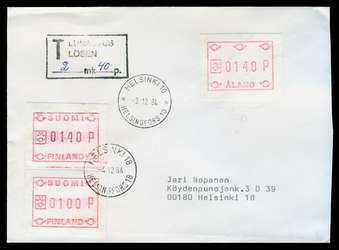 Upon arrival at "HELSINKI 18" postage due was collected with FINNISH Frama (First Design) 1.40 and 1.00 stamps, affixed and canceled. Really an exceptional use utilizing the Frama stamps of both "countries" (Åland is part of Finland), correct application of postage due rules, etc. 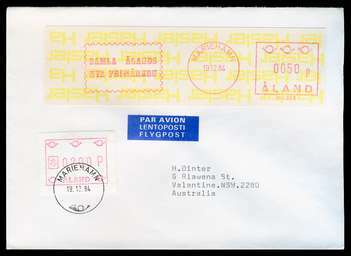 Åland Frama 1984 (First Design): 2.00 plus Åland post office counter Hasler self-adhesive meter strip (inverted background text) in the amount of .50 on 19 December 1984 airmail cover from MARIEHAMN to AUSTRALIA. The slogan of the meter strip translates to "Collect Ålands New Stamps". I cannot recall seeing any other Åland uses of this type of meter strip -- I suspect most uses were on larger packages and that it is probably "rare" on small envelopes. 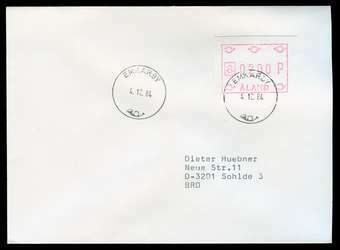 Åland Frama 1984 (First Design): 2.00 on 4 December 1984 cover from EMKARBY to Sohlde, "BRD" (Germany). Such simple, clean uses to other countries are not often seen. Åland Frama 1984 (First Design): 2.00 plus 1984 .50 Sailboat stamp on 12 December 1984 airmail cover from ÖDKARBY to the U.S.
Åland Frama 1984 (First Design): 1.10 plus 1981 Finnish .70 (+.10) Christmas Cactus TB semi-postal on 11 December 1984 airmail printed matter cover from PÅLSBÖLE to Italy. 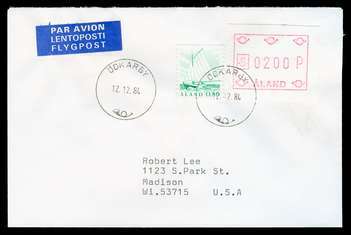 Modern airmail printed matter covers franked with stamps (instead of permit) are unusual. At this time, Åland and Finland stamps were both valid in Åland. Åland Frama 1984 (First Design): 1.40 on 5 December 1984 picture post card (general Finnish tourist montage) from JOMALA to Helsinki, Finland. 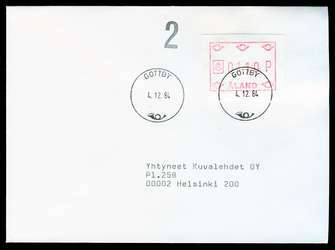 Åland Frama 1984 (First Design): 1.10 on 4 December 1984 "2" (second class) cover from GOTTBY to Helsinki, Finland. Second class covers leaving Åland are unusual. Finland #168 [1932 1.25 mark yellow M-30 Lion] (VF) on 10 August 1933 picture post card to Sweden with MARIEHAMN (Åland) cancellation. 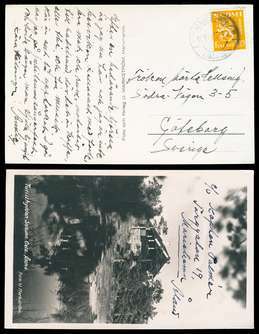 The card is produced in Åland and is a nice real photo of a tourist house near Geta. Finland #168 [1932 1.25 mark yellow M-30 Lion] (VF) on 6 June 1933 picture post card to Borgå (Finland) with MARIEHAMN (Åland) cancellation. 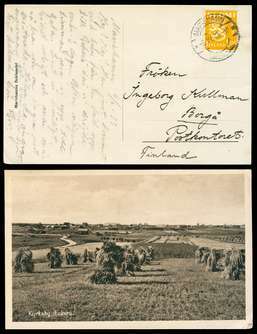 The card was at least sold (and may have been produced) in Åland and is a nice lithographed photo of a farm fields in the Kirkeby area near Eckerö. Finland #168 [1932 1.25 mark yellow M-30 Lion] (VF) on 25 July 1938 picture post card to Sweden with very nicely struck MARIEHAMN (Åland) bi-lingual cancellation. The card was locally produced Åland and is a real photo coastal scene. Finland #260 [1947 7 mark carmine M-30 Lion] (VF) on 18 December 1951 picture post card with nice MARIEHAMN (Åland) cancellation. The card is a Finnish Cancer Society charity post card (fits with a collection of Finnish charity seals); it is artist-signed (left side, bottom third) but I cannot read the artist name. Finland #213 [1937 2 mark Field-Marshal Gustaf Mannerheim] (F-VF) on 20 July 1937 (the stamp was issued 4 June) letter card ("KORT-BREV / ÅLANDSPOST" with MARIEHAMN (Åland) bi-lingual cancellation, to KARIS, Finland, with a faint but clear 21 July 1937 bi-lingual receiver on reverse. 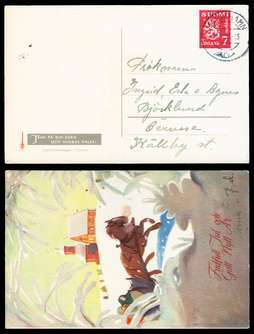 The letter card (which originally had a sealing margin that was to be torn off to open it; there is a minor rounding at lower left) contains an extensive message and is completely non-philatelic. 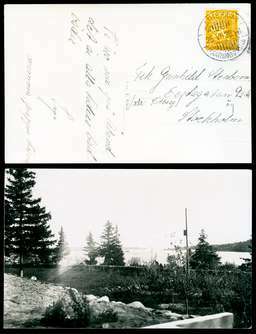 I have never before had (and I do not recall previously seeing) an example of an "ÅLANDSPOST" letter card. The card branding was presumably the invention of a local stationery supplier; I would be interested to know more about it. This stamp on cover (even when normally used from a mainland Finnish town) is quite sought after; Mannerheim was an important figure in the history of Finland. Finland #38 x10 [1890 2 penni 3-Numeral] (F-VF) on 13 June 1891cover from ÅBO (Finland) with circle-of-dots "ÅBO-FINLAND" Finland-style cancellations, to GETA, ÅLAND, with a multiple 14 June 1891 MARIEHAMN 2-ring style receivers on the front. The ten 2 penni stamps correctly pay the 20 penni domestic letter rate to 15 grams. However, this franking is quite unusual and is very dramatic. That is was used on a cover to Åland is all the better! Slightly roughly opened at bottom, but looks great! Sweden 15 öre double postal card, Facit #29a, with 6 öre additional franking (to make 20 öre rate) used both ways! 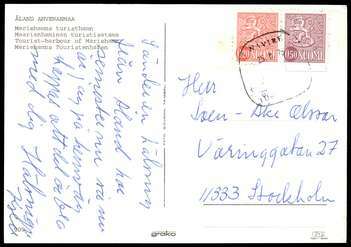 Airmail 4 June 1956 from TRELLEBORG, Sweden, to the post office at MARIEHAMN, asking about postal rates. 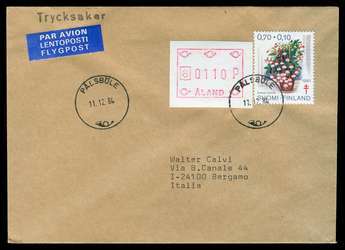 Replied 5 June 1956 airmail back to Sweden, properly utilizing the Swedish postage paid by the double/reply postal card. The reply bears an unusual handstamp of the Mariehamn post office. Though mailed by a known stamp collector, this is a very rare type of usage from Åland. Finland #402 and 464A combination pair from booklet (VF) on 25 August 1975 Åland tourist picture post card [Mariehamn harbor and ferry ships] mailed on board a ferry traveling toward Finland. 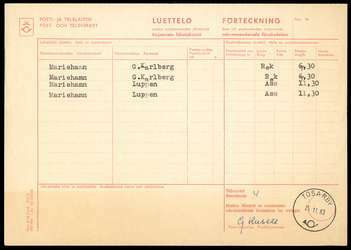 Landed and put into the post at TURKU, Finland, with unclear NAVIRE ship letter (paquebot) cancellation. 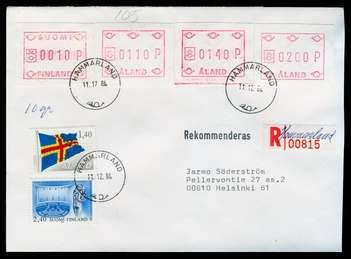 The booklet stamps are scarce on covers from Åland. Registered mail receipt 25 November 1983 for two registered and two insured pieces of mail from the village of TOSARBY with nice postmark, to MARIEHAMN. Such postal forms were rarely saved and are thus now seldom offered.